Handling Tips: Store for up to one month in a cool, dry and well-ventilated space. 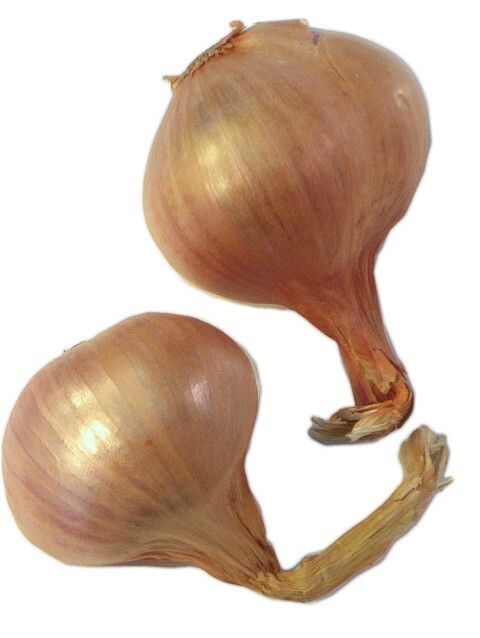 General Information: The shallot is a small sized member of the onion family (Alliums also known as Alliacae this genus is also categorized under the lily or amaryllis family.) There are more than 500 alliums and all are characterized by edible bulbs that have a distinctive aroma and flavor. The fragrance produced by alliums is a chemical reaction produced by the cutting of the different layers of their flesh; the sulfur-containing amino acids combine with other naturally occurring enzymes and create a mild sulfuric acid that may irritate the nose and eyes. History: It is believed that shallots originated in Asia and moved through India and the Mediterranean. The name ‘shallot’ is traced back to the ancient Israeli city of Ashkelon, where the Greeks believed shallots originated. There are two primary varieties sought after by the culinary community: the large Jersey (Isle of Jersey) and the smaller ‘true’ or grey French shallot. The other varieties are Cuisse de poulet (French shaped like a chicken thigh) and the Dutch which are round, with either yellow or coppery red skin. Most commercially available shallots are grown in Southeast Asian and are cheaper, smaller and more pungent than the above varieties.